Mirari's Wake WCD 2003, why isn't it legal? 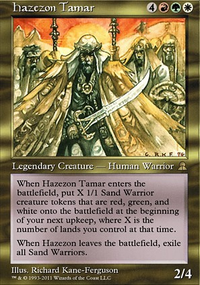 Is this designed for 1v1 EDH or multiplayer EDH? Looks like you're missing some of the staple draw / ramp cards for 5c Slivers. Descendants' Path , Mirari's Wake , Smothering Tide , Herald's Horn (ramp and draw), Domri, Chaos Bringer , Cryptolith Rite all provide ramp in one form or another. Guardian Project , Phyrexian Reclamation , Sylvan Library , Vanquisher's Banner , Distant Melody , Domri Rade , Kindred Discovery all provide draw in one form or another. 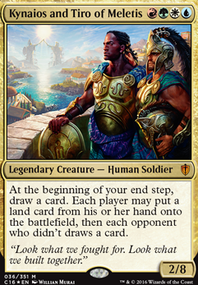 The Domri's are particularly compatible with Slivers, as each +/- ability is incredibly relevant to the creature heavy deck. Spirit of Resistance and Pariah both combo with Sliver Hivelord to prevent you from taking any damage. You DEFINITELY need to be running Cyclonic Rift . 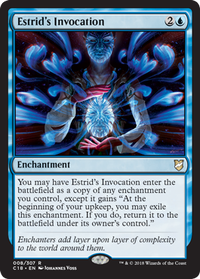 If you're playing Blue in EDH, that card needs to be in your deck. It's too good to ignore. This is just some advice coming from a fellow Slivers player. My deck is about 75%, but it's mostly lands (shocks, fetches, duals) that I'm missing. Here's the list if you're interested. Thanks! I'm glad you like the deck. Mirari's Wake is already on the list. It's great for ramp and to buff my army a bit. Ajani Steadfast doesn't really mesh well with a go-wide strategy. His +1 is limited to only one creature, and his ult is okay. His -2 is useful especially with other plainswalkers, but again I feel the usefulness is so limited that it's not really worth including him. Ajani Unyielding on the other hand...I really like this one. Card draw, removal, and excessive overrun all in one card. I just don't know where I would cut for him. 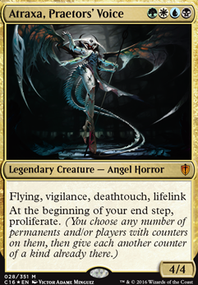 Archangel of Thune could be nice and would certainly buff my tokens each turn since she'd almost always get damage in. However I'm not sure there's room for her here unless you can convince me she is more deserving of a slot than something I'm already running. Keep in mind I'm trying to keep as much of this budget as I can. I'd have to drop close to $15 on her, and I'm already doing that for a few other cards in the list. This deck is quite awesome, but have you considered putting Mirari's Wake into it? 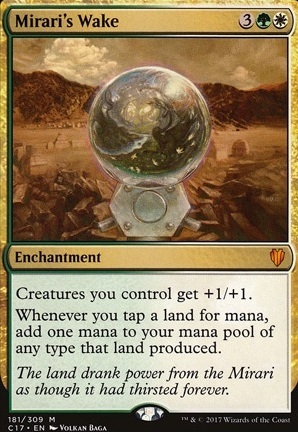 That card is so useful that I feel that any EDH deck that contains green and white should have it. 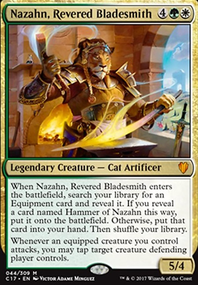 Also, Ajani Steadfast , Ajani Unyielding , and Archangel of Thune would provide additional methods for making your creature tokens more powerful. Muldrotha tends to be a prime target for removals, some additional protection wouldn’t harm. Diplomatic Immunity and Curator's Ward do the job well. Phyrexian Tower is a better sac outlet than High Market playing both is nice too. Aura Thief steals goodstuff like Mirari's Wake , Propaganda and many more. Mindslicer prevents you from surprises like Cyclonic Rift unless they’re topdecked. Night Incarnate is a nice way to deal with tokens, goblins, elves etc. Pernicious Deed is a highly feared and recurrable reset button. Havengul Lich lets you cast more than 1 creature for just 1 colorless extra and even opponents creatures. Finally Defense of the Heart and Treachery are really broken with Muldrotha. There are just so much nice cards to play with Muldrotha and not enough space in 99 cards. Feel free to take a look at my list if you haven’t already. You may find some other well fitting gems too. In terms of your maybeboard, it kind of looks like you want to build an enchantress deck. Being in white and green is a good place to be for that subtheme. Consider Argothian Enchantress , Enchantress's Presence , Mesa Enchantress , Satyr Enchanter , Verduran Enchantress , Guardian Project , Greater Good , Colossal Majesty , Elemental Bond , and Three Dreams as your draw package. Rhythm of the Wild , Ghostly Prison , Smothering Tithe , Zendikar Resurgent , Mirari's Wake , Courser of Kruphix , Burgeoning , Exploration , Sphere of Safety , Sunbird's Invocation , Aura Shards , Blind Obedience , True Conviction , Song of the Dryads , Darksteel Mutation , Grasp of Fate , Mana Reflection , Cast Out , Xenagos, God of Revels , Frontier Siege , Abundance , Duelist's Heritage , Defense of the Heart , Carpet of Flowers , and Unquestioned Authority become attractive.